April 8 – Tailplay Music Festival, organized by millennial mavericks from China, features Chinese and Chinese-American bands, local bands, art activities including a workshop with Microcosm by Teng Teng , food and drink, and other activities. Beyond Chinatown readers can get 10% off tickets with the code BEYONDCT. Through April 9 – Blind – Taiwanese director Dennis Yueh-Yeh Li adapts and stages, with a Taiwanese crew, Maurice Maeterlinck’s play by the same name about twelve abandoned beings trying to figure out their present and the future, but eventually resign to their fate. This contemporary fable to address the issue of social engagement in the current society. April 19 – 22 – A Deal, playwright Zhu Yi’s look at the contemporary experiences of Chinese abroad through an actress trying to make it in the United States and her family’s attempts to purchase real estate here. We add talks, films, performances, exhibitions, featuring or relating to Chinese, Taiwanese, diasporic artists and topics to our event and ongoing exhibition calendars as we learn of them. We post frequently on our Facebook page. So check the page for links we share and get a heads up on events before we include them in these weekly posts. Take a look also at our Instagram page. If you’re interested in contributing to Beyond Chinatown, whether writing an article, contributing photos or artwork to be featured with our weekly events and exhibitions listing, letting us know about an event, send an email to beyondchinatown@gmail.com. 1) Introduction to Chinese Music and the Instruments – Learn about the origins and histories of the instruments from members of the Melody of Dragon and Ba Ban Chinese Music Society, touch and feel the fascinating shapes and designs, and relax in appreciation of the melodious music with imagination. 2) New Music From Hong Kong Concert – A night to celebrate the unique blend of East and West! Acclaimed US and Hong Kong instrumentalists Rachel Brandwein (harp), Linda Chatterton (flute), and Aristo Sham (piano) will premiere works by Hong Kong most talented and up-and-coming composers Galison Lau, Wendy Wan-Ki Lee, Austin Yip, and others. 3) Screening of TCG’s #LegacyLeaders feat. Tisa Chang – Join MOCA for a special screening of Theatre Communications Group’s (TCG) Legacy of Leaders of Color Video Project featuring Tisa Chang, Artistic Producing Director of Pan Asian Repertory Theatre. There will be a reception at 6:30 PM and film screening and panel discussion of Impact of Asian American Arts Movement from the 1960’s at 7:15 PM. Panelists will include Cheryl Ikemiya, Senior Program Officer for the Arts at the Doris Duke Charitable Foundation; Sachiyo Ito, Artistic Director of Sachiyo Ito Dance Company and Ron Nakahara, actor/director and Pan Asian veteran. Andrea Louie of Asian American Arts Alliance will moderate. Tisa and panelists will reflect on how the Asian American arts scene has evolved and would like to celebrate all those who have added to the innovations and energies that Pan Asian has pioneered. 4) ChinaFile Presents: The Souls of China: The Return of Religion After Mao – At a moment when observers of contemporary China devote their attention to the country’s fast-changing economy and politics, Pulitzer Prize-winning reporter Ian Johnson has spent much of the past decade immersing himself in a transformation of a very different sort: China’s massive spiritual revival. Following a century of attacks on religious life, a country once held together by tradition and ritual is again teaming with temples, mosques, cults, sects, holy mountains pilgrims, fortunetellers, and politicians trying to harness them. ChinaFile and The New York Review of Books are pleased to cohost the launch of Johnson’s forthcoming book, The Souls of China: The Return of Religion After Mao, with a discussion moderated by Ian Buruma. 1) The Devotion of Suspect X – Based on Keigo Higashinoas award-winning novel, The Devotion of Suspect follows a professor (Wang Kai) assisting in a murder investigation, only to find that a longtime rival and friend (Zhang Luyi) from his early university days may be involved. 2) Tea Drunk at The Met – The Metropolitan Museum of Art and East Village tea shop host a new sit-down café with a Chinese tea house theme. This three-month pop-up café is located on the second-floor balcony overlooking the Museum’s majestic Great Hall, with its soaring domes supported by colossal limestone arches and piers. This new café serves a selection of authentic Chinese teas harvested from renowned tea-growing mountains in China, as well as small plates featuring light delicacies. Surrounded by antique Asian ceramics in long wall cases, the café offers guests an opportunity to experience a tea-drinking culture that emerged in medieval China around the eighth century and continues to the present day. Hours: Sunday through Thursday, 10 AM. to 4:30 PM; Friday and Saturday, 10 AM to 3:30 PM. 1) Qin Feng, Lee Ufan, Jian-Jun Zhang (Pace Prints, 3/9 – 4/8) – Pace Prints presents an exhibition of prints and multiples by Qin Feng, Lee Ufan and Jian-Jun Zhang. Qin Feng’s monoprints capture the artist’s dynamic hand, and fuse a Western modernist sensibility with the Chinese calligraphic tradition. The unique works on paper were created using traditional calligraphic brushes on a plate, printed only once. 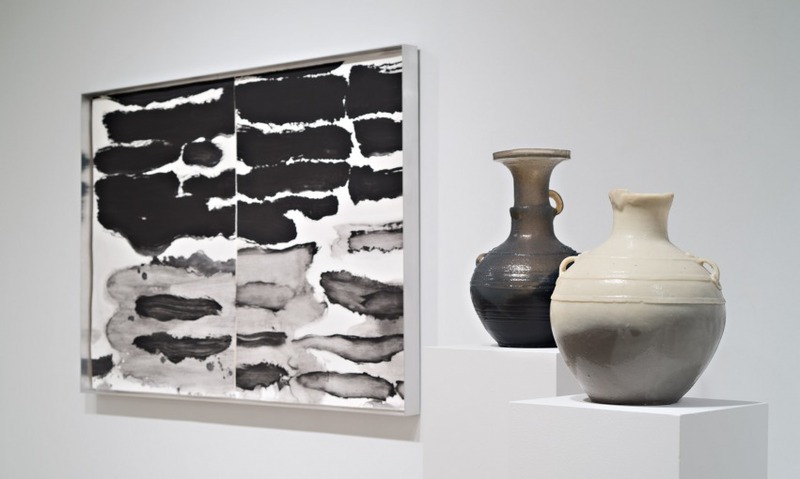 Lee Ufan’s Dialogue lithographs debuted during Marking Infinity, the artist’s 2011 solo exhibition at the Solomon R. Guggenheim Museum, New York. Jian-Jun Zhang’s Flowing Water and New Calligraphy monoprints combine water with ink, a traditional Chinese medium, symbolizing the flow of Chinese history from old to new. Installation view, photo courtesy of the artists and Pace Prints. 2) Futures, Again (P!, 3/8 – 4/12) – Once upon a time, there was a gallery called K. that lived in the storefront at 334 Broome Street where P! now stands. Its third exhibition, in Spring 2015, was by an artist named Wong Kit Yi. Her project, North Pole Futures, focused on an idiosyncratic financial, legal, and social proposition: the show offered intrepid collectors a chance to commission the artist to create a customized artwork at the North Pole. By selecting a color, an unusual word, and a specific date, each commissioner established a conceptual prompt for their individual piece, which Wong Kit Yi promised to complete during her upcoming Arctic residency. 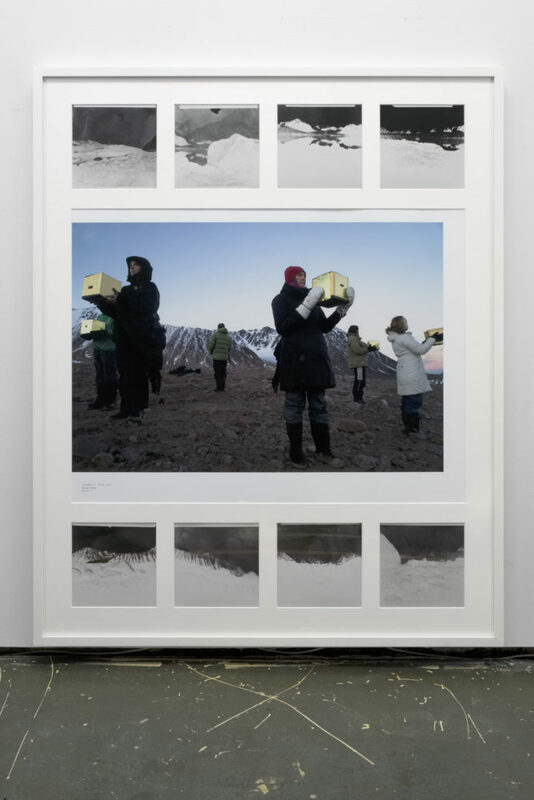 Based upon trust, the artist’s “futures” represented a unique bond between patron and performer, reflecting both the fixity and fickle uncertainty of the North Pole. Now, Futures, Again at P! picks up where North Pole Futures left off. Wong presents here the multi-faceted results from her 20-day Arctic voyage in October 2015. Seven performance-based photographic works, commissioned during the last exhibition, are exhibited publicly for the first time. In addition, ephemeral materials keyed to each day of her North Pole trip are arranged as a physical calendar in the gallery, serving as scores for future actions. Her new film, A River in the Freezer, combines directed and found footage to meditate upon glacial memory, cryogenics, and frozen fiction. Disparate subjects—ranging from Longyearbyen, Norway (a town where no one is allowed to die), the fair-haired manga character Cygnus Hyōga, 19th-century global trading in ice, and color wavelength theory, among others—are synthesized within a karaoke-inspired sing-along format. Together, this body of past and future works represents the newest chapter of an ongoing project. As the Arctic melts, we wait for what will come next. Visit the exhibition calendar for details for the current shows listed below. Check the museum or gallery’s website for hours of operation.